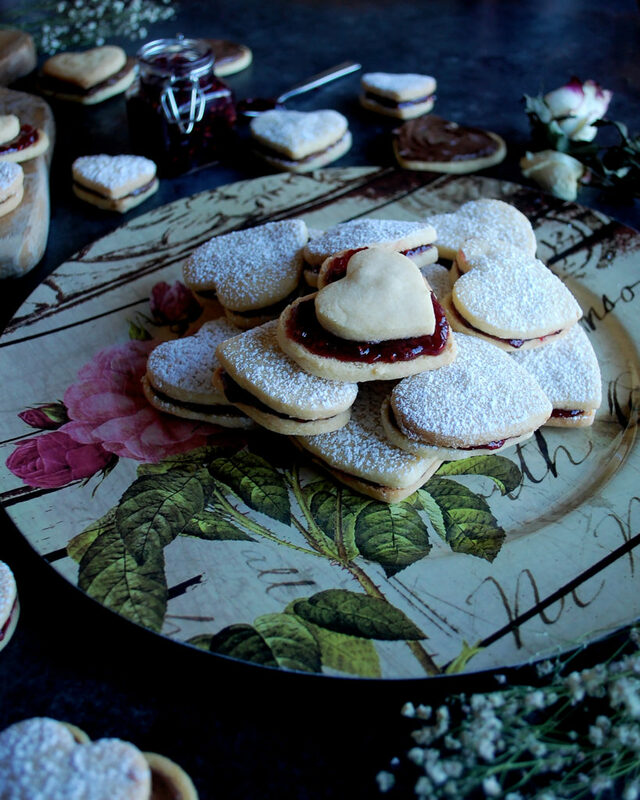 It’s Valentine’s Day, and I am so excited to eat these shortbread cookie sandwiches! Other than these being my absolute favorite cookies of all time, there’s really not too much to say about them. 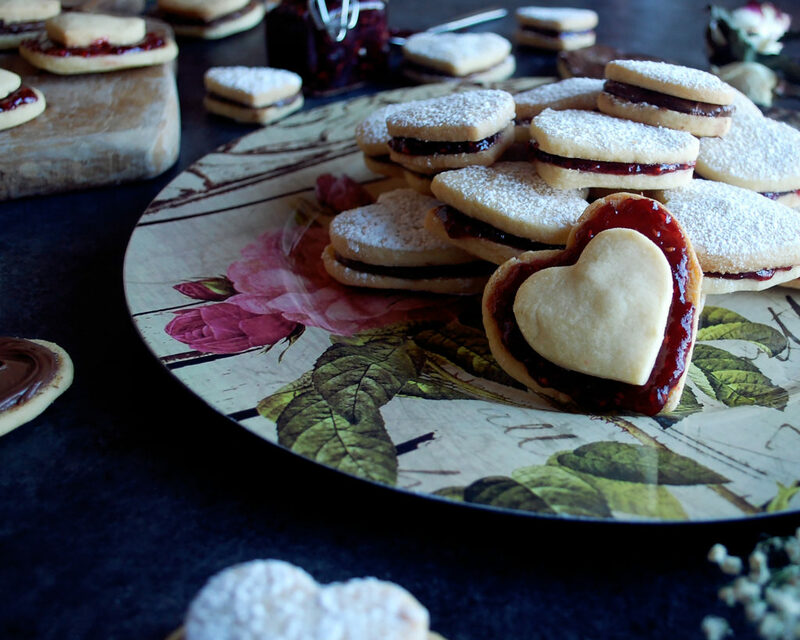 The shortbread recipe is amazing. I got it from my dad who found it scribbled in his grandmother’s handwriting on an old piece of parchment paper. All I did was add a little almond extract to the dough because I love almond with shortbread. The raspberry & nutella combination is the best. 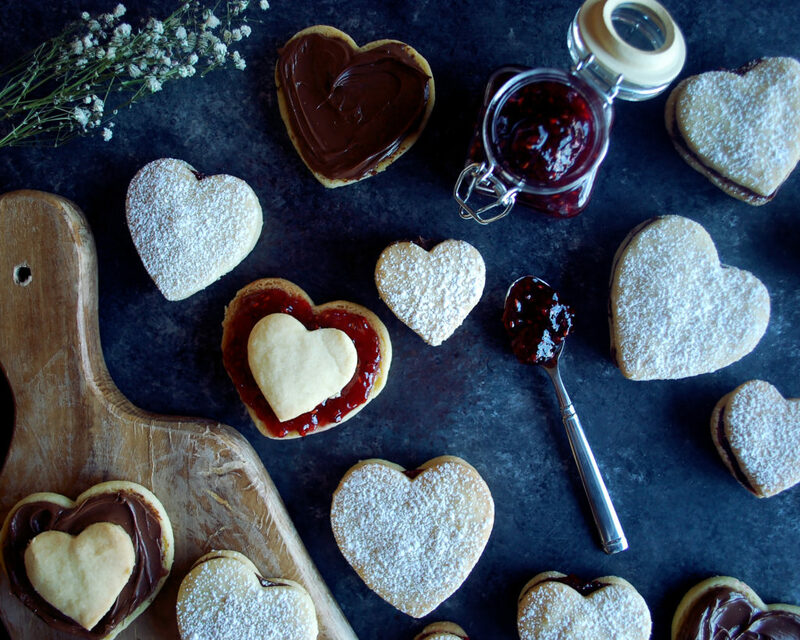 Nutty, chocolatey, fruity…all flavors that work well with a rich, buttery shortbread cookie. 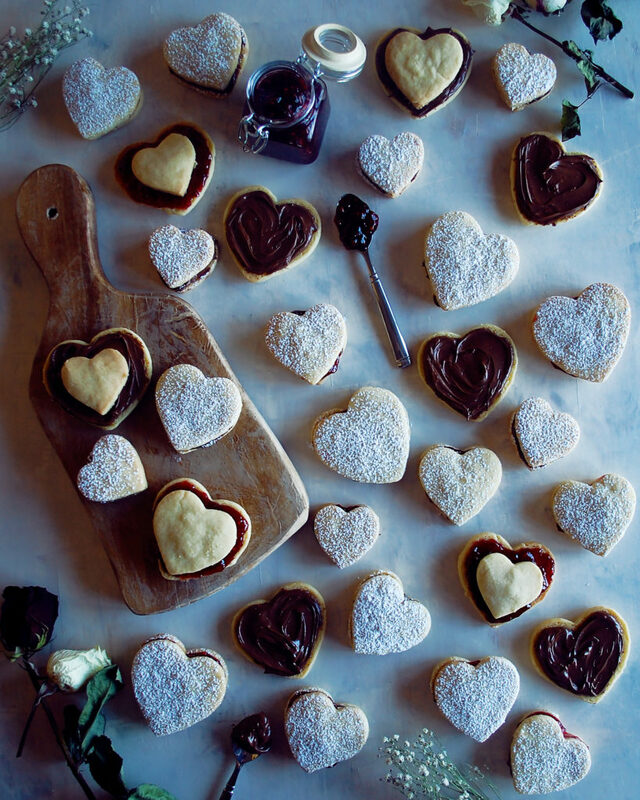 And the heart shapes are classic for Valentine’s day. 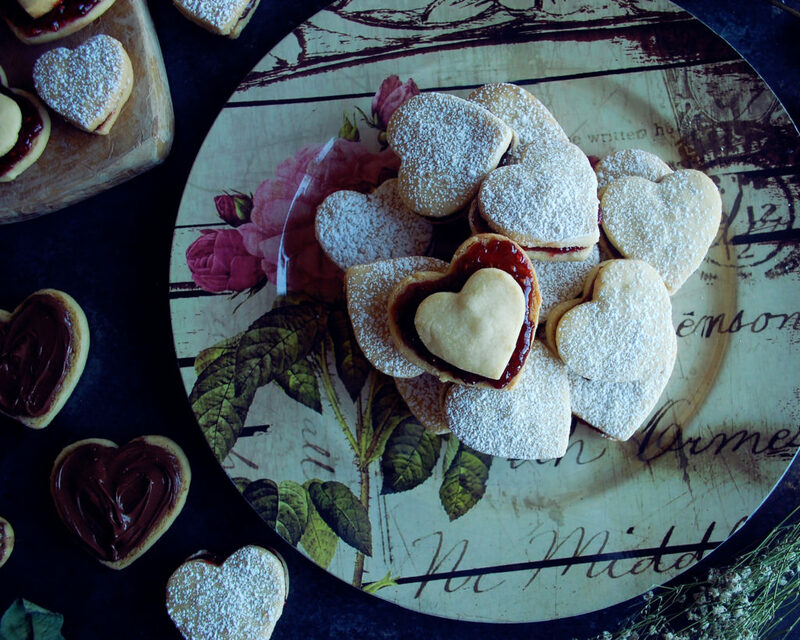 I tested this recipe a couple weeks ago, and these cookies honestly disappeared quicker than I’ve ever seen. I think the magic is in the shortbread. 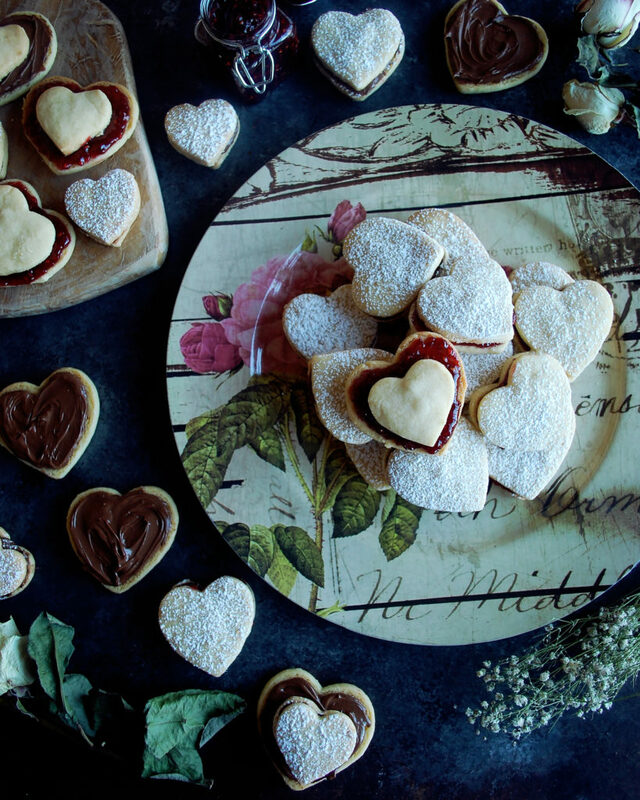 Even though I could eat an entire jar of Nutella by the spoonful in one sitting, the shortbread is kind of the best part about these cookie sandwiches. I’ve always been a big fan of shortbread. Its simplicity is pure and delicious. But this recipe is better than I’ve ever tasted. The texture is so soft and truly just melts in your mouth. It was pretty hard not to eat all of the cookies when they were warm out of the oven. There’s nothing like a warm cookie. 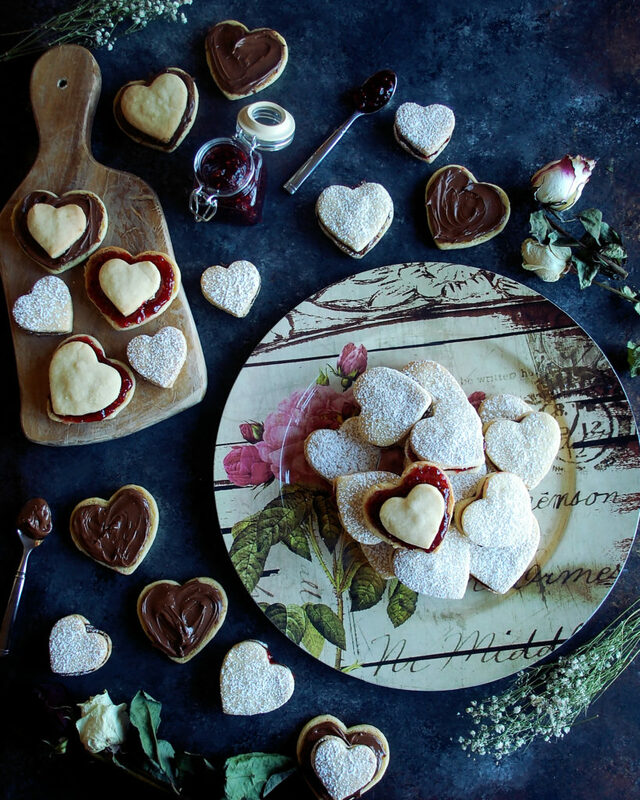 It took a lot of will power to let them cool, top them each with a spoonful of raspberry jam or nutella, and finish each one with another cookie and a dusting of powdered sugar. But the wait is well worth it. 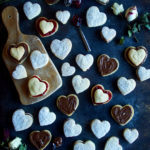 They were so good that I’ll probably end up making them for every holiday and just changing up the shape of the cookie cutter. Enjoy! Preheat the oven to 350F. Using an electric mixer, cream together the butter and sugar, scraping down the sides of the bowl to fully incorporate. Mix in the almond extract. Gradually add the flour, mixing on low speed first and then faster once all the flour is added. Once the dough comes together and the sides of the bowl are clean, turn off the mixer. Shape the dough into a ball, wrap in plastic wrap, and refrigerate for 30 minutes. Flour your surface well before starting to roll the dough (this dough will stick easily). Cut the dough ball in half so it’s easier to work with. Roll out each piece until it is a little less than ¼ of an inch thick. 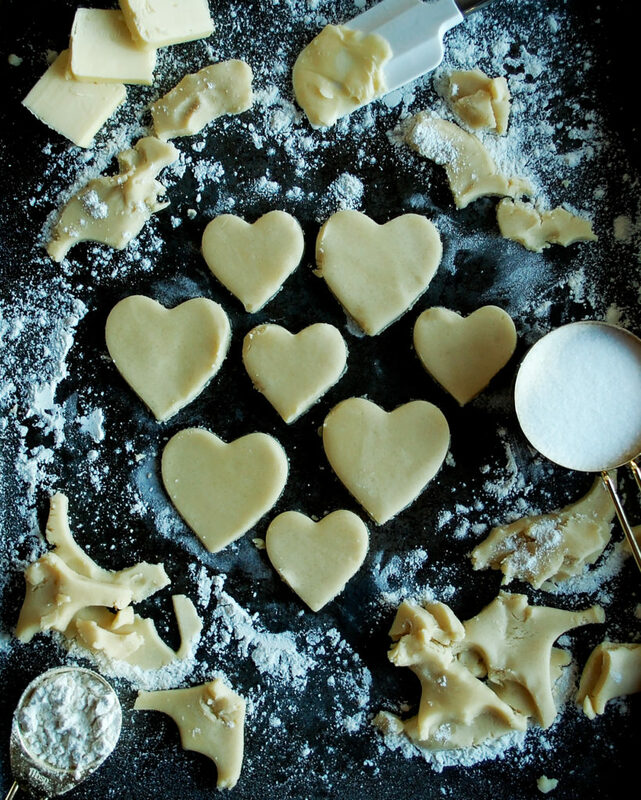 Use different sized heart shaped cookie cutters to cut out the cookies, making sure to cut in pairs of two. 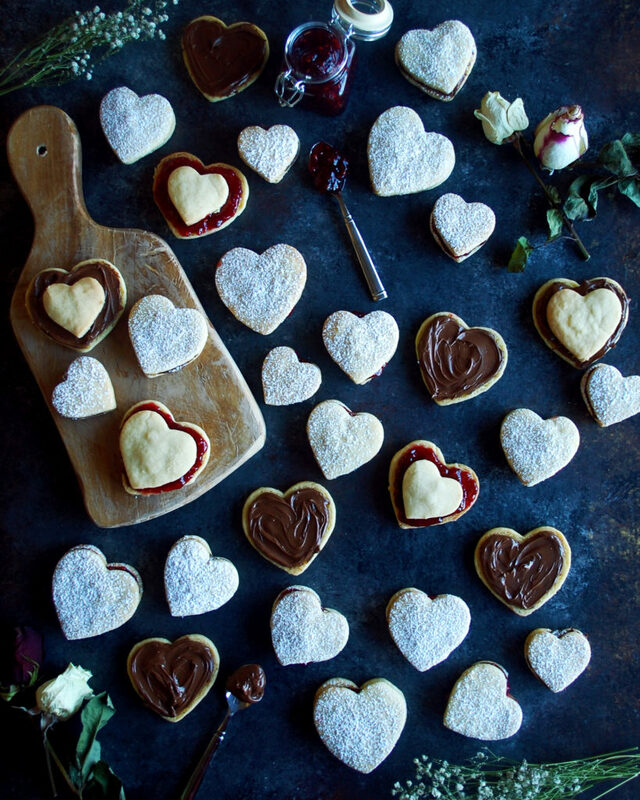 Carefully remove the excess dough around each cookie. Use a small offset spatula to transfer each cookie onto a cookie sheet. Gather the excess dough and reform into a ball. Roll and cut again. Repeat this process until all the dough is used. Bake the cookies for 12 minutes. Transfer to a cooling rack and let cool completely. 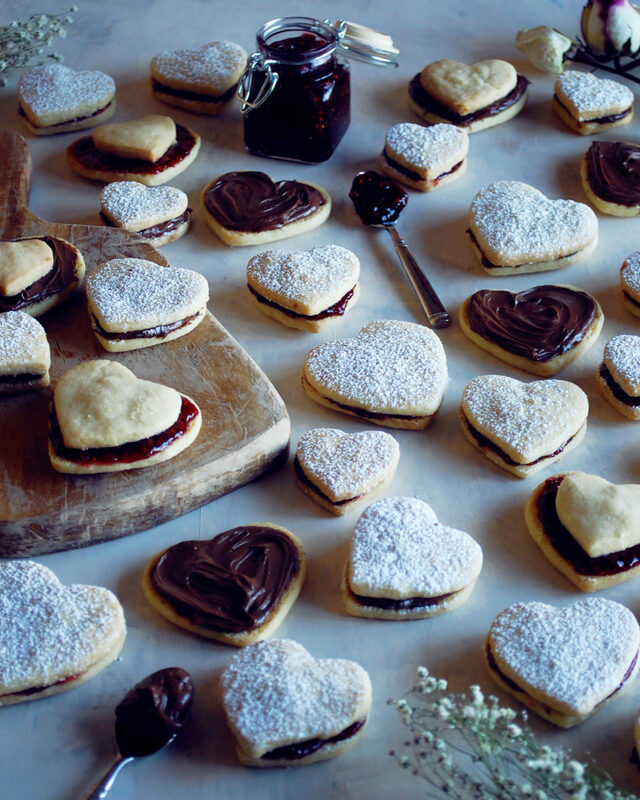 Spread the bottom side of a cookie with a generous amount of nutella or raspberry jam. Place another cookie on top, bottom side down. Repeat until you have finished all the cookie sandwiches. Dust with powdered sugar before serving. I bought my cookie cutter set from Williams Sonoma, which has 5 different sized cutters. I like to have a variety of cookie sandwich sizes for the visual appeal. You can also make some where you layer the smaller hearts on top of the bigger hearts so you can see the filling around the edges. However, if you only have one size cutter, you can easily make them all the same.